We can hardly believe this website was created back in 1999 - it still looks decent and brings in enquiries to the company! 20 years must mean great value from any website! 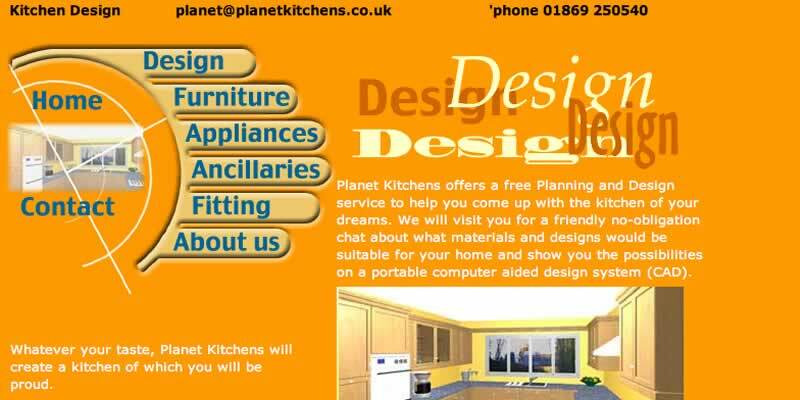 A web-site for Planet Kitchens, a quality kitchens company based in Oxfordshire. It can be difficult for a smaller company to compete with the big consumer names, but a well-designed web-site puts them on a more even footing. This design was finished for less cost than their quarter-page single-colour entry in their local printed directory. It allows any customer, anywhere in the country (and, of course, beyond these shores) to find out about their work and contact them just as easily as any of the national home-improvement companies. Probably our earliest website design still operational, this kitchen design website still looks eye-catching and different. The graphics and construction methods aren't up to modern standards, however, and just go to show how much website development has changed 'under the skin'. The site certianly won't work on smartphones - these being unknown at the time of design. The search engine optimisation for the site hasn't been updated in many years, before Google was a major force (and when Alta Vista and Excite were the leading search engines). As the criteria for what modern search engines look for changes regularly, it's important to keep a site updated even if the content doesn't need to change drastically. For this site to work well in the 21st century, it would be far better to have the navigation buttons as styled text rather than bitmap graphics, for example.